Image caption Chuka Umunna said the group had to become a party in order to present an alternative to the "broken political system". 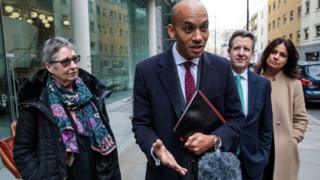 The Independent Group is in talks with the Electoral Commission about becoming a fully-fledged political party, group spokesman Chuka Umunna has said. He said the group had to become a party in order to present an alternative to the "broken political system". Eight MPs quit Labour and joined forces with three former Tories to form the group, which is joint fourth-largest in Parliament, with the Lib Dems. By registering as a party, the group can contest seats in future elections. Who are the Independent Group? Speaking outside the Electoral Commission headquarters in London, former Labour MP Mr Umunna said: "We have been absolutely overwhelmed by the tens of thousands of people who have signed up to our website, who have shown support for what we are doing and want to see an alternative, to build an alternative." "So we are here at the Electoral Commission to explore with them how we do that. Anyone can register a new political party for a small fee but there are rules about what it can be called - it can't sound too much like an existing party or be offensive, for example. New parties must also name a leader, treasurer and nominating officer - and submit a party emblem and description. It would be required to comply with strict funding rules, but the group has promised to abide by these even if it does not formally register with the watchdog. Former Labour MPs Gavin Shuker, Ann Coffey and Chris Leslie and ex-Tory Heidi Allen joined Mr Umunna at the commission. "We think people want an alternative," Mr Umunna said. Speaking later at an event in London, Mrs Coffey said the putative party "had to have a name but it's complicated". She also confirmed that none of 11 members of The Independent Group would stand for re-election in their seats before the next general election, due in 2022. The MPs quit their parties and joined forces to form the group last month. Among their reasons for leaving their parties were the government's handling of Brexit and Labour's Brexit stance - as well as the Labour leadership's handling of anti-Semitism. The eight former Labour MPs are all longstanding critics of Labour leader Jeremy Corbyn and they all support the People's Vote campaign for another EU referendum.